Ronny Deila sympathised with his Celtic players as they struggled to come to grips at times with Hamilton's pitch in the 2-1 win at New Douglas Park. "This pitch is slippy, very different from what you play on normally. I'm a fan of artificial pitches but this is something strange," said the manager. "You could see at the end with (Kris) Commons, it was like playing on ice. "When you feel you don't have good contact with the ground, it is not easy to be a good passing team." And the Norwegian continued: "We have played three or four matches here now and everybody is going on about it being slippy so something has to be wrong. It's hard for the players. "I said to them to bring two or three pairs of shoes." Having drawn 2-2 at home with Fenerbahce in the Europa League on Thursday, Celtic were caught cold when Gramoz Kurtaj seized on an error by Dedryck Boyata to put the Accies in front after four minutes. However, Leigh Griffiths made one goal and scored another - his 12th of the season - to put Celtic in front after half an hour. Hamilton's Carlton Morris missed a glorious chance to level after Craig Gordon had clawed away Ali Crawford's curling shot, and Gary Mackay-Steven was a whisker away from a late Celtic third. 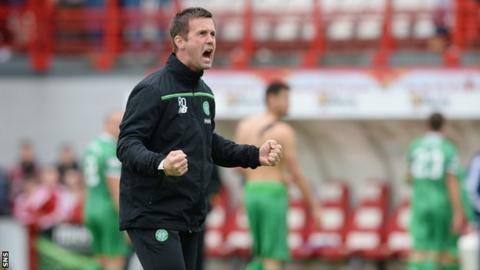 Despite his complaints about the surface, Deila was pleased to see his team move to within a point of Aberdeen at the top of the Scottish Premiership after 10 matches. "I am proud of the boys today. It was just about hard work, staying in there to get the three points," he said. "In the first half we were not ready, and that was the most disappointing thing. "We were a little bit lucky but we've been unlucky against Hearts, Kilmarnock and maybe Aberdeen. Today was about attitude and turning around a bad start. We did it and that showed character." Hamilton player-manager Martin Canning felt his team had done enough to merit a point, as they lost at home for the first time since mid-February. "We're disappointed we didn't take something," he told BBC Scotland. "I thought we controlled pretty much the whole of the second half. We created one or two half-opportunities, without creating a really good chance. "It has been a terrific start to the season. On the back of that second half we have positives to build on for Dundee in a fortnight."